Awang Batil is a traditional form of musical storytelling found in the state of Perlis. The Awang Batil is a solo performer who narrates his stories as he beats the batil (brass bowl) or belanga (pot). The batil is made of brass and is used to store water. 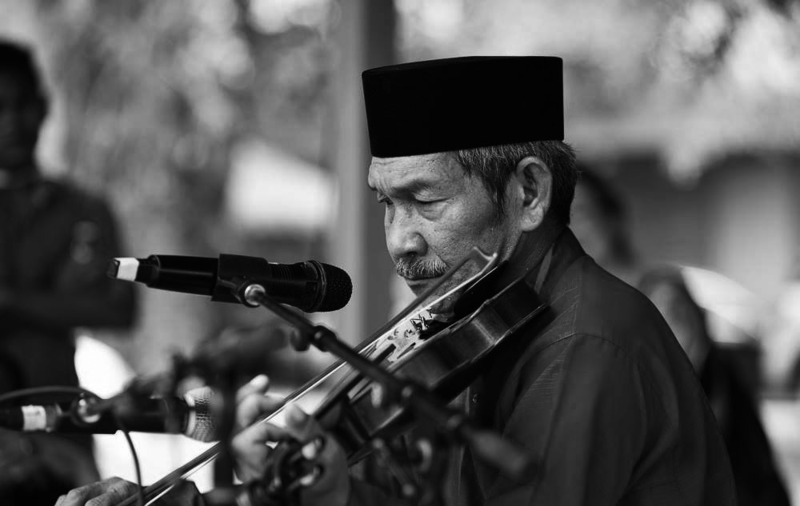 The storyteller also plays other instruments such as the violin, serunai, rebana and gendang terinai. In the course of the narration, the storyteller uses two masks; the Hulubalang mask and the Wak Nujum mask. Both are used when suitable characters appear in the stories to attract the audiences’ attention. The most commonly told stories of the Awang Batil are Raja Dewa Lok, Raja Bersiung, Raja Berdarah Putih, Anak Lang Pak Belang, Jabat Jabit, Abu Nawas, Cerita Angan-Angan and Awang Ada Duit Semua Jadi. The Awang Batil performances are usually held at weddings and evening festivities and will often continue till dawn. A performance can sometimes go on for two to five days. These longer stories are usually told when someone has personally invited the Awang Batil to his home, typically after the rice harvest season. Pak Romli Mahmud is the last Awang Batil of Perlis. He comes from a lineage of Awang Batil storytellers who have passed on their legacy and stories. His late father, Mahmud Awang bin Wahid (1903-1992) was the most famous storyteller from Kampung Pokok Sena, Chuping, Perlis. The batil that is used by Pak Romli has been handed down to him and is a relic of his father’s spirit. Almost all the instruments used were made by Pak Romli and his family before him.